Conesville Wastewater Treatment – French-Reneker-Associates, Inc. This project began with the preparation of a preliminary engineering report to evaluate the sanitary sewer and wastewater treatment system. The report recommended increasing the size of their lagoon system. The report was also used to support a successful Community Development Block Grant (CDBG) application to gain grant funds to pay of portion of the project costs. State Revolving Fund (SRF) loans were used to fund the local match. This project was complicated by the significant migrant worker population which lives in Conesville during the summer months. Negotiations were required with the manager of the migrant workers and the Iowa Department of Natural Resources to arrive at design flows and an appropriate cost-sharing agreement. 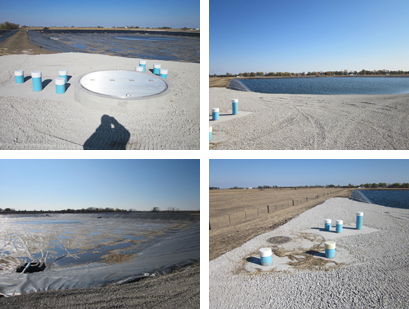 High groundwater levels and poor soil conditions required the use of a synthetic liner for the lagoon cells.